Reniece Boyce of Trident Sports Phoenix plays a shot against UDeCOTT North Starblazers in the Courts T20 Grand Slam at the National Cricket Centre, Balmain, Couva. PHOTO BY ANIL RAMPERSAD. 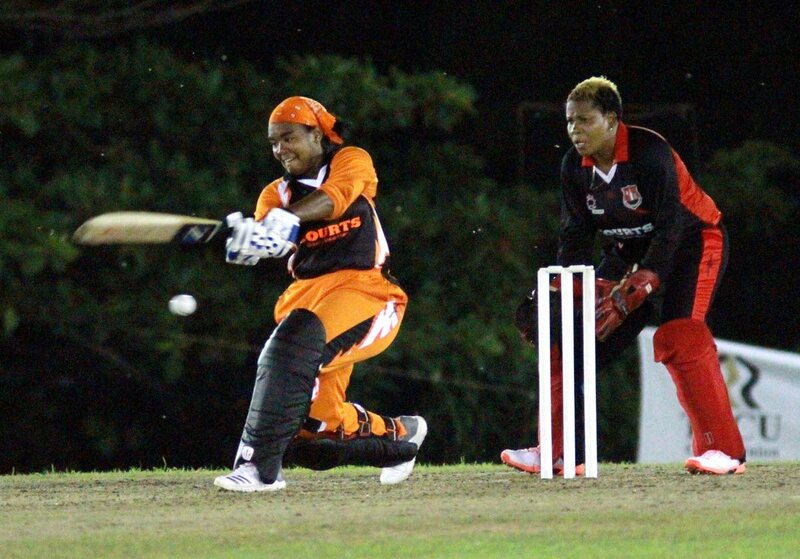 UDECOTT North Starblazers looked like champions on the opening night of the Courts T20 Women’s Grand Slam on Wednesday at the National Cricket Centre in Couva. The Starblazers comfortably chased a challenging score of 154 against Trident Sports Phoenix to start their title defence with a seven-wicket win. At the halfway stage, Phoenix were in the driver’s seat, posting 153 for five with West Indies player Stacy-Ann King cracking an unbeaten 78. Rachel Vincent was the star for UDeCOTT, batting through the entire innings as she blazed an unbeaten 83 to guide the Starblazers to 154/3 in 19.1 overs. Speaking with Newsday after the win, Vincent was proud of her effort as she recently had to overcome tendinitis in both knees. Vincent had able support from her teammates as multiple partnerships helped the Starblazers start off on a winning note. “The girls supported well. We kept having good partnerships which was important and everybody just backed each other and we came through,” she said. The Starblazers got their run chase off to an excellent start, as Vincent struck fast bowler Shamilia Connell for a few fours in the opening over. However, the slow outfield because of rain during the day made boundaries had to come by. Stephanie Ragoonath got the first breakthrough, trapping Starblazers captain Lee-Ann Kirby leg-before for six with the score on 30. A 63-run second wicket partnership between Vincent and Jodian Morgan entertained the crowd of approximately 100 people at the venue. Starblazers were 45/1 after eight overs, before the pair cracked 32 runs in the next two overs to get back into the contest. King introduced herself into the attack and with her first ball got the wicket of Morgan for 30. Morgan, who faced 15 balls and struck one four and three sixes, was caught at long off by Tremayne Smartt. A 22-run partnership between Vincent and Natasha McLean (11) kept the Starblazers on course for the win. After McLean fell with the score on 115 in the 15th over, Vincent and Shabika Gajnabi (16 not out) avoided any further damage as Starblazers got to the total with five balls to spare. Vincent’s knock lasted 63 balls and included seven fours and two sixes. Earlier, King’s unbeaten 78 and 20 from Connell took Phoenix past 150. Left-handed King faced 61 deliveries, hitting seven fours and one six. King, who batted at number four, rescued her team’s innings as she came to the crease with Phoenix 14/2 in the third over. Kirby, more known for her batting, was instrumental with the ball for Starblazers, taking 4/21 in four overs. The other match scheduled for Wednesday night at the Wilson Road Recreation Ground in Penal, between TECU Southern Titans and LCB Contractors Central Sharks was abandoned because of wet conditions. Last night, Phoenix faced Titans at the Brian Lara Cricket Academy (BLCA) and the Sharks played Starblazers at NCC. 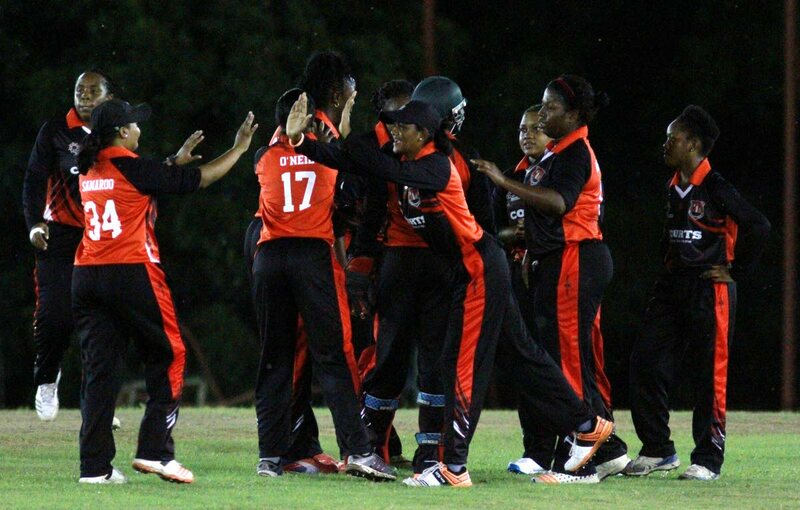 SUMMARISED SCORES: Trident Sports Phoenix 153/5 (Stacy-Ann King 78 not out, Shamilia Connell 20; Lee Ann Kirby 4/21) vs UDeCOTT Starblazers 154/3 (19.1 overs) (Rachel Vincent 83 not out, Jodian Morgan 30). Starblazers won by seven wickets. Tomorrow (Saturday) – LCB Contractors Central Sharks vs Trident Sports Phoenix, NCC; Udecott North Starblazers vs TECU Southern Titans, BLCA. Reply to "Vincent shines for North Starblazers in Courts T20"